I have a great piece of real estate to sell you…. Throughout time we have seen irrational exuberance (As former Fed Chairman Alan Greenspan once stated). You can easily look back to the gold rush, numerous times in the stock market, real estate a few years ago, gold and bonds today. Can social media being seeing similar irrational exuberance? This has been a thought I have had for some time. I have been watching and talking to numerous businesses over the years but I have seen a shift in their emotions from a little fearful to today where I worry many businesses are being taken advantage of. What has changed? Many companies have started in social and realized it is not as fearful as they once thought so now they want to take advantage of the space and make real money from it. Also because there is much interest from the C-suite, many people in business want to prove how smart they are. I also think there is some blame that goes to many ad agencies and PR firms who are selling social to firms without providing the insight necessary. Recently Jeremiah Owyang and the Altimeter Group put out a new report about the Social Media Strategist role. I highly recommend reviewing it. It provides a little insight into the difficulties of the role. Many times you are dealing with this irrational exhuberence throughout different silo’s within the company. Putting out the fire for every person that want to create that next Facebook page or create that ‘viral’ marketing campaign. C.C. Chapman put out a post on Friday after hearing a preview on the Today Show stating: “Our most ambitious viral video ever coming up this half hour.” I did not get the chance to see the show, but with that quote alone I know they did not understand social. 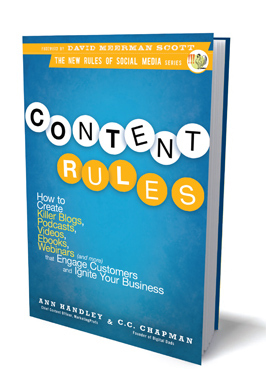 Make sure you check out his post and when you have time read his new book Content Rules (it is co-authored with David Meerman Scottand friend Ann Handley, @Marketingprofs). If you want to create something viral, first rule is you do not decide what goes viral, your audience does. It is also important to offer something that is unique (first wins in social) and finally it really should offer something to the viewer or others and not focus as much on the brand. They also tend to be fun. A few good examples are the Swagger Wagon videos by Toyota, Blendtech: Will it blend, Old Spice Guy. So next time your marketing, PR firm, or internal employee talks about creating the next viral campaign, I urge caution. If you are in a position where someone asks you to create one, it is very important that you educate the people asking. Are you sure you want to be the social strategist? Even the best laid out ideas can easily fail. The question is how much risk does the organization want to take? What is the appetite for risk and failure? How connected are they to their Customers? Beyond the viral marketing angle, I have other concerns I have noticed increasing in the past few years. I have seem a large interest in engaging ‘influencers’ with the belief this will make the message grow. First there is a myth when it comes to this term. First I believe many organizations by the way they have engaged people have created poor expectations with this group by treating them differently. I highly recommend treating them as any other Customer. Special treatment creates further expectation of special treatment. This is not sustainable. This is a topic I can discuss forever, but my focus was influencers do not create viral actions, good content is what creates it. Many of you know of a famous video from my prior employer with a sleep technician. Did you know that it was posted by someone with only 2 videos posted? That became a huge brand influencer. What has made many people rise to the ranks to be considered an influencer has been strong content. If you want your brand to rise up, provide strong content, great Customer experience and the best products. This will create the viral effect you want. Finally I have a fear that some companies are putting too much money toward a variety of social efforts with unreal expectations, or because they simply do not know better. This is being caused by social strategists, PR and marketing firms alike. They are asking for large number of employees for tasks that could be done by a few, or large dollars for campaigns that do not go anywhere, etc. For those of us who believe social is a key communications tool of the future, and in many cases now, it is imperative that we set the right goals, and create the right expectations. This helps us all by creating trust and showing the right business acumen to ensure long term success. There are many PR/marketing firms who have done very well for the companies they serve, including companies like Edelman, Weber Shandwick and many others. I also have the utmost respect for anyone who has the Social Strategist role, because as you can tell from this post, it is not easy. I apologize for not posting for a while. With my recent job transition I have been taking a lot in and continuing on my personal path of learning and growing in my career. I promise you that I have been thinking of many posts that I want to share and discussion I would like to have with my readers on topics from Customer Service, social media, marketing, and leadership. Hopefully you will see many more of these posts in the coming weeks, and I hope many of you take part in the conversation. As many of you know I tend to be very opinionated on a variety of topics. Most of these opinions have been built over time by listening to others, reading and trying to think through various topics of interest. At the same time I love alternative views because they add to the learning experience. At the same time I am never afraid to be a lone person on a topic, even if it is not a popular position within the discussion. As an example I always see the debate who should own social media. The two areas discussed are PR and marketing. Of course now I work in marketing, so I should probably take that side of the debate, but instead I like to point out that the Customer is the one who really owns the discussion regarding a brand in social media, so why not Customer Service? They are the most suited for the discussions with Customers. At the same time, I think it really needs to reside throughout the organization, especially since many employees are already taking part in the conversation, no matter what your company policy may say. But this takes me to the point of this post. Over the years I have read many books on leadership and other business related topics. Many of the books are from the most respected people in the business world. I have always had (and still do) the utmost respect for these business leaders, but as I grow I wonder how many were truly leaders vs great business people? I do not see anything wrong with being a great business person. That means they had a phenomenal career and did well for their shareholders and employees (in most cases). I have always had a fascination with Jack Welch, who many consider a leader who not only brought great profits to GE shareholders, but has also been emulated by many other business people. According to Wikipedia, he also teaches leadership to select MBA students at MIT. But was Jack truly a leader or a successful business person? This is a point that can be debated for days. On the leadership side he was relentless in cutting costs, driving units to be 1 or 2 in their business, and he grew GE from a $14 billion dollar company to $410 billion dollar company. In the mid 1990’s he brought Six Sigma to GE from Motorola and made it a basis for reducing more costs. In his book “Straight from the Gut” he has a chapter called “The People Factory.” In this chapter he outlines his belief regarding forced rankings, and how imperative it is to cut the bottom 10% every year. In other parts of the book he also outlines his belief regarding professional development and bringing in the top talent. He created the famous training facilities on the GE campus. I used to be blown away by his success and what I perceived as leadership. Six Sigma became popular through business culture for over 10 years due to Jack. But today as I look back I wonder how much of this was leadership? Six Sigma was simply following. Who does not want to be number 1 or 2 in the business they are in? Rankings and cutting the bottom 10% seems easy and not that uncommon? At the same time the reason why rankings, and curves became popular was because it is always easier for managers to rate people higher, even when it is not deserved. That was the point behind his chapter. At the same time the trouble I have always seen with Six Sigma is people used data that made sense to the point they wanted to make, even if there was conflicting data elsewhere. Anybody who has worked with forced rankings have seen ways that it’s manipulated (oh this person quit, so now we will rank them low so we can bring up someone else). As I look at GE after Jack has left I have seen an NBC unit that has not performed as well, and a culture that was simply broken. The competitive nature made it hard to get things done, and the organization ran on fear. Jeff Immelt, the current CEO, in my opinion has done a great job, but much of the early years were spent making the organization more nimble and creating a culture that is innovative, more nimble and more team oriented. I recommend reading more about Jeff and the post Jack period in this 2005 Business Week Article “The Immelt Revolution.” History will decide the leadership of Jack, but it is an interesting discussion on what leadership has been and what it will look like in the future. Jack Bogle is the founder of the Vanguard Group, but many do not know the details of this company. As you may know Vanguard Group is a financial services company that is mainly focused on mutual funds. What you may not know is the company is actually owned by the funds it operates, which is very unique and is the reason they have had such a focus on the Customer. It did not come about in a usual way. Jack was chairman of Wellington Management company when he was fired. What you may not realize is most funds have their own board. He convinced the board of the funds to allow him to create a company to service the fund for low cost. The fund’s board followed him and now Vanguard offers some of the lowest expenses in the business thanks to this new ownership structure. It was outside the box, and in many ways permanently changed the mutual fund business. Expenses continue to be driven down around the industry thanks to Jack. Steve Jobs has to be on this list, no matter how you may feel about him or Apple. Steve does not follow anyone, but instead works of instinct as to what Customers want, whether they realize it or not. There is a lot of risk in leading the way, but the reward, as Apple has seen, can be great. Apple was not the first computer, phone, mp3 player or touch device, but each device was designed in a way that was and continues to be a game changer. Bill Gates and Warren Buffett under any definition have been great leaders in business, but I am more fascinated by the work they have been doing to lead others in giving back to society and the world. They are leading their peer group and much of it is by example. Cluetrain Manifesto was written by Rick Levine, Christopher Locke, Doc Searls and David Weinberger was written in 2000, well ahead of time but their thoughts were on target. Brian Solis has been talking about the impact social media will have on business well before many of us even knew what social media was. His insights have been coming true for a long time and this has made him one of the most respected people in social and in business itself. Chris Brogan has made a career out of teaching us how to effectively use social media. He has taught us how to best speak in the space, understand the marketing benefits and connect with each other. Chris is one of the most giving people I have ever met. Tony Hsieh and Zappos have shown us the importance of running a business with the right culture in this new world. What some may refer to as an experiment, is a successful business model that will tried to be emulated by others in the coming years. Reading Tony’s book Delivering Happiness provides insight into this model, but beyond that interacting with anyone from Zappos shows what it is all about. I can go on forever speaking about people like Paul Greenberg, Scott Monty, David Armano and so many others. My point is social media is filled with leaders, and no matter what, it pays to at least listen to many views. We all can learn from each other and maybe some day we will be viewed as the leaders.